The level of complete blindness and intellectual dishonesty on the part of the establishment media still manages to astound me. Their inability to "see" that from the very start of the Trump presidency they have deliberately done everything in the power to terrify the nation, causing an epidemic of "Trump Anxiety Disorder," that has led to hundreds of examples of violence and harassment against Trump supporters, yet now whining that President Trump's statements about the Fake News being the "enemy of the people," is "dangerous," and "will lead to violence." Many have seen the flashback video below, but in order to adequately show proof of the establishment media deliberately and irresponsibly terrifying liberals all across the U.S., we have to remember the immediate and very public, on-air statements, aka meltdowns, from well known names in the media, who are supposed to report the "news" objectively, and high profile talk show hosts. In those nearly two years, ANP and many others have documented a significant number of actual "fake news" stories from the establishment media about President Trump. 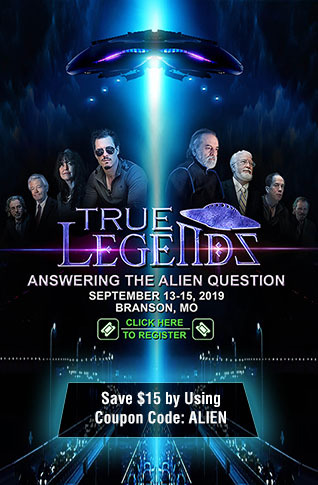 Many needed corrections, editors notes, retractions, deletions and total rewriting, including title changes, because the initial reports were completely false and/or misleading. In one case the errors were so egregious an ABC News anchor, Brian Ross was suspended without pay after his fake news tanked the stock market, and in another case three CNN employees were forced to resign. President Trump has called them out publicly at rallies and on his Twitter account. Back in July 2017, long time, and former left-leaning journalist Michael Goodwin, in an outstanding article, discussed "why the media has broken down in the age of Trump," and put the majority of the blame on the New York Times and the Washington Post, stating "The two leading liberal newspapers were trying to top each other in their demonization of Trump and his supporters. They set the tone, and most of the rest of the media followed like lemmings." As we know now, most of the media totally missed Trump’s appeal to millions upon millions of Americans. The prejudice against him blinded those news organizations to what was happening in the country. Even more incredibly, I believe the bias and hostility directed at Trump backfired. The feeling that the election was, in part, a referendum on the media gave some voters an extra incentive to vote for Trump. A vote for him was a vote against the media and against Washington. Not incidentally, Trump used that sentiment to his advantage, often revving up his crowds with attacks on reporters. He still does. Now we see that the New York Times publisher, A.G. Sulzberger, is the latest in a long line of journalists and media personalities whining to President Trump about his public statements calling the "fake news media" an "enemy of the people," and claiming that such rhetoric is "dangerous," and "is contributing to a rise in threats against journalists and will lead to violence." Really? What about the the dozens of NYT and Wapo reporters, and network station talking heads, and CNN so-called "journalists," etc, and their daily, sometimes hourly "inflammatory language" and constant attacks on President Trump, his supporters, his policies, his tweets, his statements, his rallies, etc..? Sulzberger wants to complain about the president calling them on their fake news, their consistent negative and hostile coverage, claiming it "will lead to violence," yet refuses to acknowledge the media hysteria, and outright fake news, inaccurate reporting, and general hostility towards President Trump and his supporters since before the election, has led to over 538 documented cases of violence, harassment and vandalism against Trump supporters, administration officials and conservatives across the country. 388 of them since the 2016 presidential election. He wants to whine about how the President's rhetoric against a biased and dishonest press causes "threats," that may potentially lead to violence against journalists, when the media's actions already has led to a significant amount of violence, death threats against Republican congressmen's young children, destruction of property, and Trump supporters who have been harassed and physically attacked in public, sometimes for doing nothing but wearing a MAGA hat, or having a Trump flag on their lawn? Note- This was going to be my article on Monday, but I truly could not wrap my head around the amount of mental gymnastics that Sulzberger had to display to be able to offer those quotes, while totally ignoring the fact that his publication, along with Wapo, CNN,, and other network news stations, have literally infected nearly half the nation with Trump Derangement Syndrome, or to be more politically correct, as the mental health experts call it, "Trump Anxiety Disorder." Greg Gutfield discusses that in his intro segment below. Newsflash for the media: Friends do not attack each other, enemies do. Friends do not terrorize each other, enemies do. 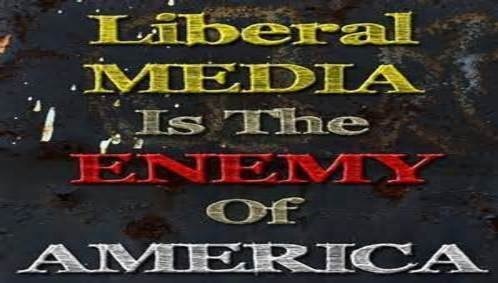 Liberals may not view the media as the enemy because the media is now reinforcing the terror they have been programming them to believe since before the 2016 election, but the other half of us see the media clearly for what they are and what they have been doing. We didn't need the President to tell us, we see it every single day in the news' headlines, on television, and from media pundits on social media. 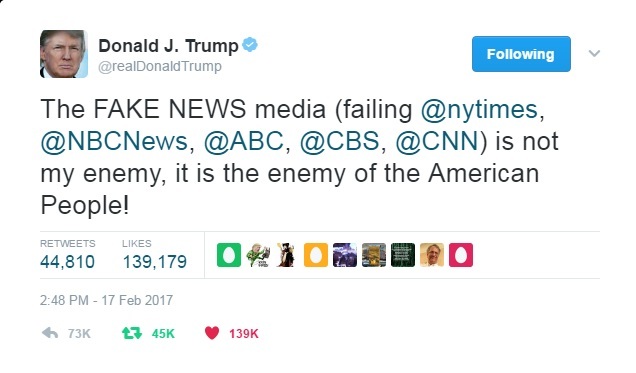 If the media wants to stop being called the enemy of the people, then they should stop acting like it.